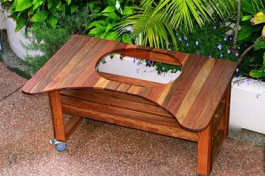 Bring your dream backyard alive with timber furniture from the outdoor furniture range at Outdoor Furniture Online! Your outdoor area is where you can relax and enjoy the open air after a long week and likewise where you’ll get together with family and friends throughout the year. This is why your outdoor living furniture plays such an important role in a home. Will it be chic and modern, rustic and welcoming, straight forward and functional? 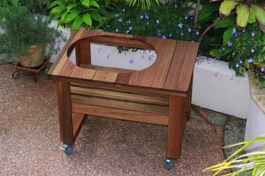 As a result at Outdoor Furniture Online, our range of outdoor furniture includes a wide variety of styles to match your taste along with the look and feel you’re aiming to achieve in your outdoor area. Shopping for outdoor furniture online makes the experience of filling your home with stylish and affordable pieces easier than ever. You don’t even need to leave home to pick out these pieces. Simply browse through our outdoor settings, tables, chairs, and everything in between. If you see something you like, email us. You can pick it up or have it delivered to your doorstep for a fee. When you shop online, click on any item and a full product description with details such as size, and materials will pop up therefore you’re well informed before making a purchase. BYO table legs – because if you’ve got the legs – we’ll make the top!! 4217 Recycled Table was a project we did using old cast iron legs and frame that our client picked up at auction. The whole objective of the table was to make suitable for a communal table, one that everyone could gather around and enjoy for a while in a busy commercial precinct. This 4217 Recycled Table was made to order and can be reproduced to suit your size, style, colour or timber choice and depending on legs we can source if you haven’t got your own! Browse our extensive range of indoor and outdoor chairs online or view our collections of timber and contemporary chairs. The Primo Oval XL Loaded is extemely user friendly and the most versatile BBQ grill in the world. 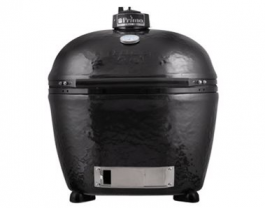 Why purchase a pizza oven + BBQ + offset smoker + slow roaster when you can have it all with the Primo Oval XL Loaded. All ceramic BBQ grills are not created equal! Primo takes no short cuts and is made of premium-grade ceramics. Other “kamado-style” cookers are made of less efficient clay-based material, the Primo is composed of the finest ceramic blend for superior heat and moisture retention. With 60% more efficiency than competing ceramic grills, Primo burns less fuel, reaches desired cooking temperature faster, and allows less moisture to escape, reducing cooking times and producing juicier meat and more flavoursome food. All Primo Grills are proudly made in the USA! The Primo Oval Jr Loaded is extemely user friendly and the perfect Primo grill when cooking for a party of two, yet big enough to entertain the entire family or group of friends. Why purchase a pizza oven + BBQ + offset smoker + slow roaster when you can have it all with the Primo Oval Jr Loaded. The following accessories are included with your Primo Oval Jr Loaded: Primo Oval Jr, Primo Pizza Stone 13 inch, Primo Searing Grate for Oval Jr, Primo Heat Deflector Plates for Oval Jr, Primo Firebox Divider for Oval Jr, bag of Primo Lump Charcoal, box of Primo Quick Lights and Primo Ash Tool and lower drip pan racks. The wood-fired Primo Kamado BBQ, made from ceramic and based on a 2000-year-old Japanese design, is one of the hottest BBQ trends. Low and slow or hot and fast, the Primo Kamado can do it all from cooking brisket over oak and hickory woods at 90C to searing steaks at well over 400C. 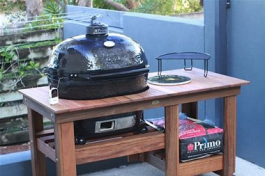 Turn your Primo Oval XL or Primo Kamado into a wood-fired pizzeria. Glazed Primo Pizza Stone 16 inch makes for easy cleaning as well non stick when cooking gourmet wood-fired pizzas.